Fastnet lighthouse is owned by the Commissioners of Irish Lights and is situated 4 miles off the most southerly point of Ireland, Cape Clear. 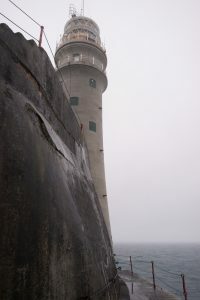 It is situated on the Fastnet rock, a staging post of the Fastnet Race made infamous in 1979 by a yachting tragedy in which 18 sailors and 3 rescuers perished. The lighthouse experiences dramatic wave impacts during stormy weather and the complex reef causes even modest waves to overwash the base of the tower. At 54 m high it is the tallest lighthouse in the study and it was completed in 1904. The STORMLAMP team undertook modal testing and deployed initial monitoring equipment on December 2016; what was meant to be an overnight deployment became a week-long one after foggy conditions descended. 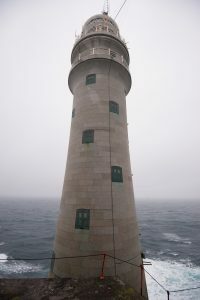 Initial structural modelling has been undertaken of the Fastnet tower and is being compared with field data.